“The active oversight by Congress adds another guardrail to this process and it demonstrates that the United States takes this transition very, very seriously,” said Rep. Greg Walden (R-Ore.), who chairs the committee’s communications and technology subcommittee. The House Energy and Commerce Committee, chaired by Rep. Fred Upton (R-MI), on Wednesday 17 June 2017 approved H.R. 805, the Domain Openness Through Continued Oversight Matters (DOTCOM) Act, bipartisan legislation to protect the future of the Internet. Authored by Rep. John Shimkus (R-IL), the DOTCOM Act ensures that Congress continues its oversight role over the administration’s work to transition its Domain Name System authority from the United States to the global Internet community. The bill would give Congress more oversight of the plan to give up America’s control of the Internet domain name system. The lawmakers also expressed concern that the organization is not ready for the transfer. Some supporters of the IANA transition have indicated that it will not be completed by September — when ICANN’s current contract with the Department of Commerce expires. 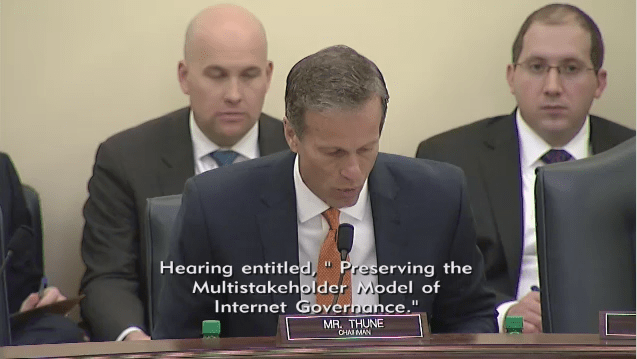 “The DOTCOM Act serves as an essential check within our government. The Internet has come a long way from its days as a government research network and the concrete steps toward privatization have made it stronger. As we look toward taking another step in that process – removing the U.S. government from its oversight of the Internet Assigned Numbers Authority – we must look before we leap,” added Chairman Upton. The legislation was approved by voice vote, as was an amendment addressing a word change. Text of the legislation, the amendment, and video of the markup are available here. IANA Transition postponed to June 30, 2016. Will it ever happen?